The Sun is planning to up its print run by more than 100,000 copies during the Olympics, while also plotting to sell ten of thousands of copies of the tabloid in Poland and Ukraine during the Euro 2012 Football Championship. Rob Painter, marketing director at The Sun, has disclosed that the News International-owned tabloid is planning a double assault on the two big sporting events this summer. He said: "It is all about taking The Sun brand where our customers are". The football tournament, in which England are competing, takes place between 8 June and 1 July. Copies of The Sun will be printed in Germany during the competition and News International has hired promotional staff to sell the paper during the tournament being held in Poland and Ukraine. The Sun sold thousands of copies in South Africa during the 2010 World Cup, while the Daily Mirror also sold copies there. It is unclear if rival newspapers are planning to sell copies in Ukraine and Poland. Painter said he was also "expecting an increase in demand for The Sun during the Olympics", likening the demand during the Games to that for a major football tournament. 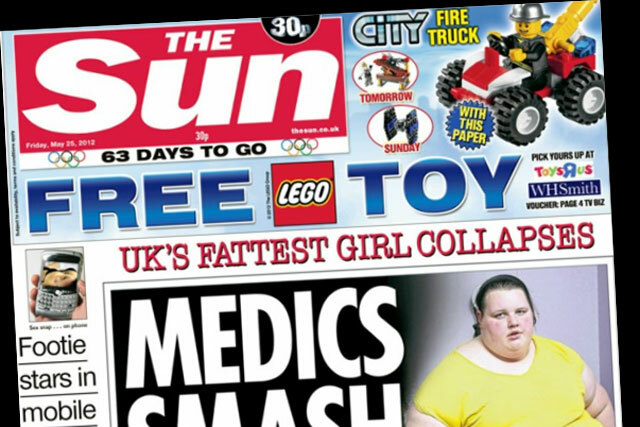 The Sun is the UK's biggest-selling paper and, according to audited figures, reported a circulation of 2,624,008 in April. Painter said The Sun was likely to increase the print run of the tabloid by around 100,000 copies on certain dates during the Olympics that it believes will resonate with the public, such as the day after star athlete Jessica Ennis competes. Other papers are also expected to up their print runs during the Olympic fortnight. Separately, The Sun is running a trade marketing campaign under the strapline 'Original Social Media'. The campaign will run across a number of print titles. The five-week campaign aims to show that The Sun's stories influence conversations at home, work, in cafes and pubs, online, and across social media networks. Painter said: "The Sun continues to fuel more conversations up and down the UK every day than any other media brand. That's why we call it the 'Original Social Media'." The campaign was created by Grey. Is Saturday key for brands?